Washington Post lacrosse guru Christian Swezey tackles the top issue facing Division I lacrosse today: growth. Or more specifically, the lack thereof. Lacrosse is exploding across the country. High school programs from Florida to Michigan to California are thriving, with more than 1,000 schools adding lacrosse over the last 25 years. But while Division III has matched that growth– doubling in size to 145 over the same time period– Division I has not. When Butler dropped its lacrosse program in January, it brought the total number of Division I lacrosse schools down to 56, only 6 more than where the division stood in 1982. So why hasn’t Division I lax matched the growth of the sport? One popular explanation is Title IX. 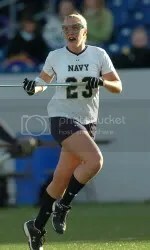 Division I women’s lacrosse has grown to 81 programs, with more being added every year (including at Navy next year). Unlike the men’s game, D-I women’s lacrosse stretches from coast to coast with programs at Cal, Stanford, Oregon, St. Mary’s, and UC Davis. A team from the midwest, Northwestern, has won the last two national championships. This kind of growth is possible because there is no women’s equivalent to football. Football eats up 85 scholarships at I-A schools and 63 at the I-AA level, so any idea of adding another men’s sport is already handcuffed if the school is to remain Title IX compliant. Even without Title IX, though, money would still be an issue. Coaches’ salaries, recruiting, travel, equipment, and 12.6 scholarships aren’t cheap. Men’s non-revenue sports are usually the first to get cut at most schools, as any wrestling or gymnastics fan could tell you. It’s no surprise that colleges aren’t scrambling to add another one. The dirty little secret, though, is that many people in the lacrosse community don’t want Division I to grow. Look at who some of the best teams in college lacrosse are: non-scholarship Ivy League schools, service academies, Johns Hopkins… If Division I grew to include I-A mega-schools like the those in the SEC and Big XII, what would happen to the traditional powerhouses? The answer is the same thing that’s happened in every other sport that these schools once dominated; eventually they’ll fade away as larger state schools with lower admissions standards take over. For some of the game’s biggest supporters, that isn’t very appealing. Lacrosse is still a tight-knit community in the Northeast, where everyone more or less knows each other. A lot of people want to keep it that way. So where can growth in Division I come from? The answer might be Division II. Bellarmine is a small school (2,500) whose sports compete in Division II. The school started its lacrosse program in 2005, and in 2006 played its first full season in Division I. NCAA rules prohibit a school from fielding teams in both Division I and Division III. There is no such rule for Division II, though. Lacrosse is now the flagship program at Bellarmine, who is using the growing popularity of lacrosse to raise the school’s profile. The Bellarmine model could be a blueprint for other schools to follow. One way or another, Division I needs to grow. Whatever other motives people might have, nothing is more important than giving more kids the opportunity to continue playing the game they love after high school. That’s supposed to be what it’s all about, right? Hey, from a proud Bellarmine grad (with a connection to the fine state of Maryland), thanks for the mention. I am excited about the new program; they’ve got a nice, new stadium, and, being the only lax program in Kentucky, are increasingly popular.